Chinese President Xi Jinping and Iran's Supreme Leader Ayatollah Ali Khamenei met Saturday, pledging to beef up practical cooperation between the two countries and jointly safeguard security, peace and stability in the region and around the world. Noting that China and Iran enjoy a long history of friendly exchanges, Xi said China will always be a "reliable cooperative partner" of Iran and stands ready to deepen bilateral cooperation on all fronts. China and Iran are "natural partners" in implementing the China-proposed Belt and Road Initiative, the president said, calling on the two sides to boost cooperation in infrastructure, interconnectivity, production capacity and energy within the framework of the initiative for the benefit of the two peoples. Xi told Khamenei that China will unswervingly follow a peaceful development path and adhere to an independent foreign policy of peace. "China is willing to maintain mutual support with Iran in regional and global affairs, and jointly safeguard peace, stability and development in the region and around the world," he added. 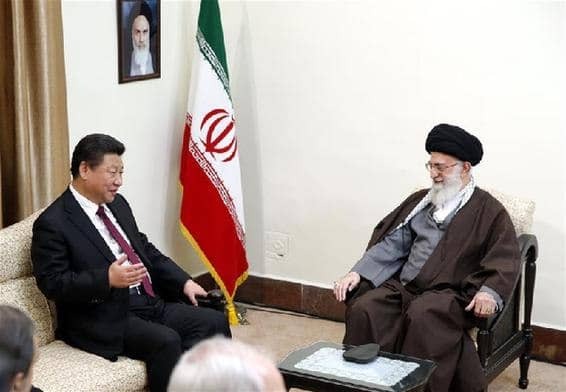 Khamenei expressed gratitude to China for its enduring support for Iran, and said that Tehran is willing to push the bilateral practical cooperation to a new high. Iran is an important country along the Belt and Road and stands ready to play a greater role in jointly pursuing the initiative with China, the supreme leader said. He said China is a very influential country in the world and Iran hopes to strengthen communication and coordination with China to jointly safeguard security, peace and stability in the region. Xi concluded on Saturday night his five-day, three-nation tour in the Middle East, which had previously taken him to Saudi Arabia and Egypt. It is Xi's first overseas visit this year and also his first trip to the region since becoming Chinese president in 2013.